Kilkenny County Council had begun a project to green Woodstock Gardens and Tea Room. 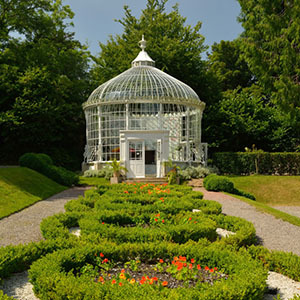 Woodstock Gardens, located on the outskirts of Inistioge village, is Council operated and is home to a mix of formal and informal gardens with an arboretum, walled garden, terraced garden, yew walk and a rose garden. It also has a playground, toilet blocks and a seasonally opened tea room. The proposed project had three elements; the first element was to investigate the practices of the seasonally opened tea room to determine if better efficiency can be achieved regarding food waste prevention & waste management. Energy and water efficiencies in the tea room, toilet blocks and staff buildings located within the gardens were assessed to determine if they could be improved. The second element of the project was to look at the practices being completed by the gardening team and draw up a case study of the strong environmental practices they complete on a routinely basis. The third element to the project was to communicate the findings and highlight the good efficiencies of the gardens to the general public. A case study was launched as part of October Re-Use Month in October 2017. An activity sheet suitable for children under 12 years old has also been developed and distributed via the tea room customers; this incorporated both an environmental and heritage theme. The toilet blocks and tea rooms carry advertisements of best practice and prompt users how to incorporate them into their own household. A resource efficiency measures review is planned in 2018 to compare it against the energy, water and waste management 2017 baseline data to determine the advancements made. This body of work will form a starting platform to determine if Woodstock Gardens is suitable to promote its environmental activities through a recognised international recognised parks award programme. This project has linkages with the local tidy towns group of Inistioge village and may also improve the environmental performance of the local community centre.